It all started in 2012 when one of the initiators hiked up Langtang Valley with his son. After four days of walking, they reached Langtang village, where they met Dindu Lama, who ran a trekking lodge with his family and nephew Pasang. Lodges are a major form of livelihood for the Sherpa people in this part of Nepal: wooden buildings with a few extra rooms fitted with rough beds for the hikers to sleep and a kitchen for cooking rice, lentils and vegetables. They loved the stay with the family and formed a peculiar bond with them. On a late April morning in 2015, Didnu‘s village was swept off the face of the Earth by a stone avalanche triggered by the most horrific earthquake in Nepali history. Within a few minutes, life was turned upside down for the region. 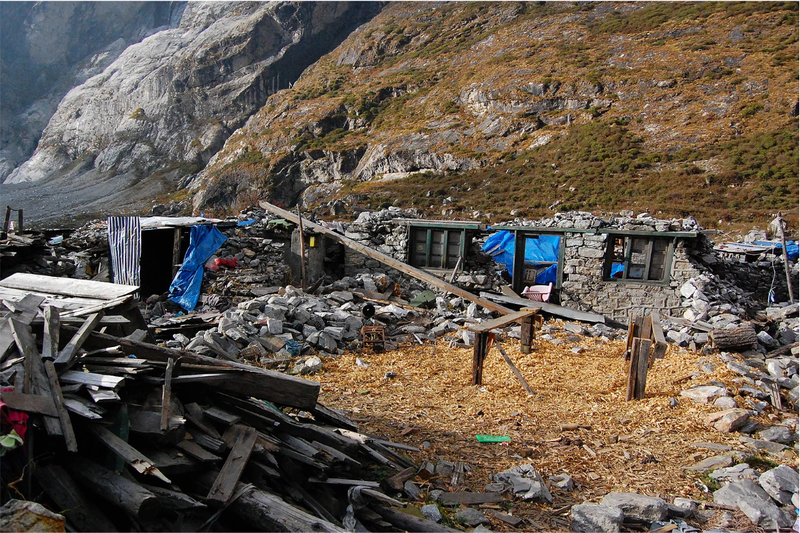 Most of Langtang village disappeared and Dindu perished with most of his family. Only his son was saved along with three of his cousins; their parents and grandparents all died in the disaster. Pasang was 24 at the time of the tragedy, the oldest surviving member of the family. He was a student at University in Kathmandu, the capital, when the earthquake hit the country. Even he lost most of his family in the valley, he dreamed about the possibility to rebuild previous livelihood and the village that used to be the heart of a magnificent valley. 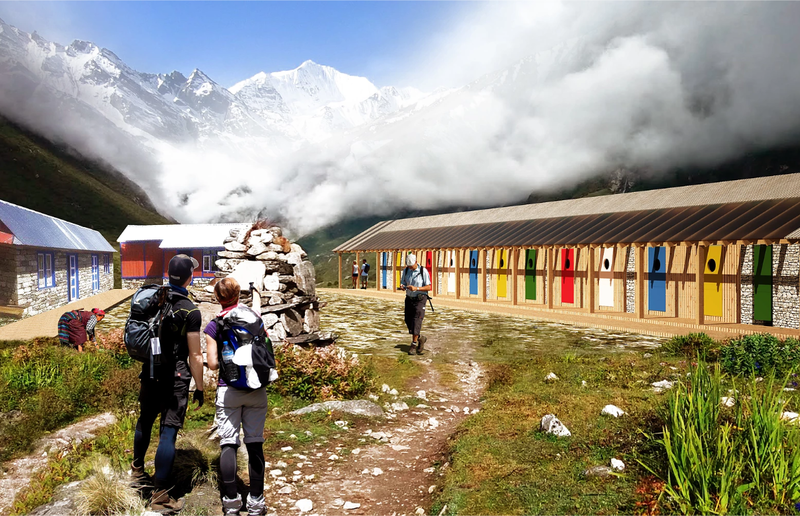 And that was the first idea that lead to a project which objective is to build a new ecological touristic lodge in Nepal that would use modern technologies for energy production, water management and heating. The authors want to set up Pasang‘s lodge as a guiding light for the whole region: with sustainable water management, on-site production of energy and a zero-plastic policy. And they want to employ some exciting new technologies to achieve it. The trick is to build a modern lodge using traditional Nepalese techniques. The materials will be local: mostly wood and stone. For the building innovative yet simple ways would be used to build a structure that can withstand another earthquake, something that has recently been pioneered in Nepal by a large charity outfit. The heart of the matter is in the technology, however: the lodge should be self-sufficient and with a minimum waste footprint. The innovations revolve around three ideas: off grid energy, waste management and water sustainability. There will be a water ozonisation system for purifying water so Pasang will be able to avoid selling bottled water, one of the worst sources of plastic pollution. There will be a biogas tank collecting organic and toilet waste and continuously breaking it down with bacteria to produce gas for cooking and heating. Finally, the lodge will be fitted with solar collectors and a newly developed ultra-compact hydropower turbine for the stream that runs by. Extra energy will be channeled into a small greenhouse for growing vegetables. The first step has been already finished, the campaign helped to collect money for the new building itself. Next steps that should help to get funding for the technologies are being prepared.